I’m not sure, how many of you have felt the great 2007-2009 Economic Recession. Abruptly people at their mid-40s became jobless with no outlook of getting another job even at a lower salary☹. Businesses went bankrupt, homes sunk in mortgage, thousands of people came out into the streets, common man’s dreams shattered forever. 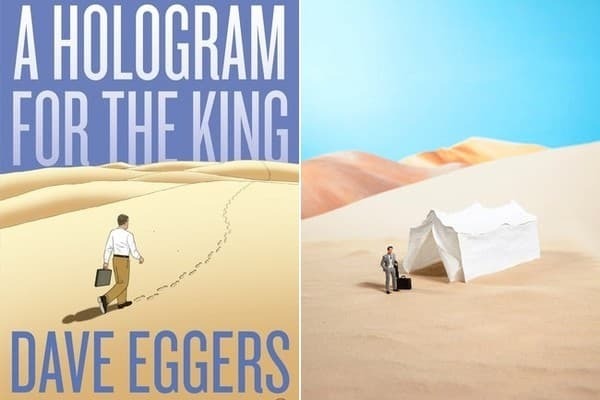 Alan Clay, the main character of the book - Hologram for the King, is the one from that unfortunate crowd. Alan Clay, a 46 years old American sales man reaches Jeddah in Saudi Arabia – to peddle a holographic teleconference system to King Abdullah’s newly planned (yet to be constructed) economic city in the middle of a deserted land. However, the King doesn’t seem to be in a rush to meet them; Alan and his team of experts were not even given a proper place to stay or work. Alan finds a hotel to stay, but his team of software experts had to use a large tent at a dessert area, with no air conditioning or internet, for both stay and work! Alan's days run with no luck to meet the king or to get the basic facilities done ; his team spends days with playing solitaire and sleeping in the tents, with wondering of will the meeting the king ever happen. In parallel, Alan’s flashback story reveals why he’s that desperate to get this contract done. Alan Clay was a former board of director of a big American bicycle company (when bicycles were still manufactured in the U.S). Economic Recession turns his life upside down – his company goes bankrupt, he gets into a big debt over $100K, his wife leaves, and he’s pushed into a situation that he can’t pay his daughter’s school fee☹. Due to his past connections to a distant cousin of the King Abdullah’s, Alan gets an opportunity to sell the holographic teleconference system to King, and that’s his final hope of salvage!. Days of waiting become weeks…During the waiting for the king, Alan meets a few critical characters and builds-up some rapport: first with a young Saudi taxi driver who drives him around, then with a young Danish consultant who was working at the same site for a different project, and finally with the female Saudi doctor who surgically removes the lump on his neck. On a fine-day, the king arrives, demo goes well, yet Alan, once again find himself replaced by globalization, cheaper-labour and eventually machines!. In the end, Alan’s team returns back to America, but Alan stays in Saudi, starting a new life with the Saudi doctor he met. Dave Eggers is one of the best writers of our time - author of 17 different books and two screenplays, including fiction, nonfiction, and a memoir, several of them best-sellers; many of his works are considered to be a ‘real mover’ or ‘shaker’ in the literacy world; however, the hologram for the king did not really pull me in, that story is such a flat and slow. I finished the book a couple of weeks ago and I don't really remember many scenes, even the ending - but I can still FEEL the failures, uncertainties, distress, humor and innocent curiosity of Alan Clay. I think, that must be the goal of the author. He seemed to be not bothered about the plot, but affixes an impression on how a middle-aged American worker can find himself floating along in life/career and find himself in the oddest of circumstances. If you want a diversion from regular fast-paced drama & thrillers, then this book definitely worth a read!. It’s a quick read, you may finish it in a day or two, but the mood will stay with you for a few weeks at-least. Hmmm, this sounds interesting. Great review! This sounds like a thoughtful read - thanx for the info! I haven’t read too much about the recession - just lived through it as a teenager. 😂 Sounds like a “thinker” of a read. First time I've heard of this book. Great review. Great honest review I am sorry this book fell flat for you I hope your next book is a much better one. Thank you so much for sharing your awesome post.